As a human race, we still have moments here and there where we can truly make a positive impact on the world around us. But as the planet’s population continues to grow and our environment continues to die, the opportunities to make a positive impact before it’s too late are becoming more and more rare. While some areas of this world have been industrialized to the point of no return, there are still some beautiful, awe-inspiring places we can conserve. There’s a shoreside city called Hermosa Beach in Los Angeles that is a prime example of one of the beautiful spots on this earth that we can still conserve. The only problem is, there’s also a proposed oil drilling project that is threatening to destroy everything it stands for. Before we talk about the oil drilling project, let me give you some background on Hermosa Beach. Hermosa Beach is a community-oriented, family-friendly beach town where good friends and strangers alike greet you on the street. It’s a place where dolphins swim by and pelicans regularly soar overhead in flying Vs. Residents and visitors stroll, bike and roller skate a boardwalk named “The Strand,” while others swim, surf, paddleboard and boogieboard in the ocean. And it has some of the prettiest beaches and sunsets you will ever see (in fact, “hermosa” actually means “beautiful” in Spanish). On top of that, it’s one of the few places in bustling Los Angeles where you can take solace from the hectic pace and loud noises of the city. Well, because I moved to L.A. for the first time just a few months ago, and Hermosa Beach was my introduction. There are fewer and fewer spots in this world where you can truly be alone and at peace with your thoughts, especially in crowded cities like L.A. American society, in particular, has become so fast-paced and commercialized that sometimes we forget what a quiet, tranquil place like Hermosa Beach can really do for us. And a place like Hermosa Beach cannot be analyzed or studied enough to fully quantify its value—it can only be felt. While I live elsewhere in L.A. these days, I still make weekly or biweekly drives back to the beach town that gave me more than I can ever repay it for. Its tranquility and the people I met there allowed me to make some life changes that I never was able to before, for whatever reason. It was a sanctuary that gave me a clear purpose and direction back then, and it’s still a sanctuary for me these days when I need to step back from the busy world. I know I’m not alone when I say an oil drilling project would not only take away its beauty and tranquility, but also its calming (and potentially transforming) effect on people. Way back in 1998, the City of Hermosa Beach halted an oil drilling project led by Macpherson Oil Company after concerns about a safety report from the California Coastal Commission. In turn, Macpherson, citing lost damages, sued the city for hundreds of millions of dollars. It wasn’t until 2012 that the City Council settled for a $30 million agreement. E&B Natural Resources consequently paid Macpherson $12.5 million for the rights to the project, then loaned the City of Hermosa Beach $17.5 million. If residents don’t lift the oil drilling ban in Hermosa Beach at the upcoming vote, the city will have to pay back the $17.5 million. If residents lift the ban, the city will only have to pay $3.5 million. E&B announced in March 2013 in a study it paid for that access to drilling would deliver $519 million to the city and $12 million to the school district over the 30-to-35-year life of the project. However, $285 million would flow into the city’s General Fund, while $234 million would be restricted to the tidelands fund, which is only reserved to a particular section of the city. On top of that, this estimate has been criticized as being inaccurate. In fact, the city paid for studies of its own (the Cost Benefit Analysis and the Environmental Impact Report) and the studies found that the city could receive substantially less ($118-$270 million based on CBA, $451 million based on EIR). The school district would allegedly receive from $1.2-3.8 million over the course of the project. Then there are the health and safety concerns. According to the City’s Health Impact Assessment (draft), it’s “likely” that particulate matter related to the project would have a “severe” health impact on the area. It’s also likely that hydrogen sulfide and odor would have a “moderate” health impact. Of course, the assessment also notes that there’s the possibility of volatile organic compounds, traffic injuries and a spillout/blowout (all with severe consequences). Residents will be able to vote on the matter in the November election. Of course, some suggest—including myself—that the amount of money potentially gained is irrelevant. The health and safety concerns of the project outweigh the potential reward. Plus, what happens to Hermosa Beach’s image—both locally and internationally—if drilling is allowed? Stacey Armato, committee chairperson of Stop Hermosa Beach Oil, has been a Hermosa Beach resident since the summer of 2012. She had lived in the area for less than a year when she found out about the city’s agreement in January 2013. But it only took a few months for the city to grow on her enough to take action on the issue. She found that plenty of residents were upset when they heard news of the agreement. Stop Hermosa Beach Oil started the Keep Hermosa Hermosa campaign on Independence Day last year. She said the non-profit initially put up 100 banners around town and gave out 50 hats for the cause. There are now roughly 650 banners spread out across the city. Armato cited numerous reasons why drilling at Hermosa Beach would be a bad idea, including health hazards, safety concerns, potential odors and its effect on wildlife and views of the ocean. Also, the drilling combined with the dense population (20,000 residents in a 1.4-square-mile area) poses serious risks, including traffic accidents and a blowout. One travel agent living in Hermosa Beach said she wasn’t necessarily opposed to the act of oil drilling; it’s just that Hermosa Beach wasn’t the place for it. The safety risk of installing 34 oil wells underneath a 1.3-acre parcel of land surrounded by businesses and homes, as well as the fact that this drilling would be allowed to be a 24/7 operation at times, didn’t sit well with her. As a resident and travel agent, she’s also concerned about the impact drilling could have on the vacation hotspot’s tourism. The noise will keep people up at night (including herself), construction will impede traffic and it’s also the wrong message to send to the world. It’s important to continue to bring in business and tourism to support the infrastructure of Hermosa Beach, she said, but there are better businesses to attract and more innovative approaches to use for the city. Hermosa Beach is just one example of a one-of-a-kind destination that we can potentially save today. We do have a choice in some matters as citizens—and protectors—of this planet. The Keep Hermosa Hermosa campaign has not only been successful in terms of raising awareness about the oil drilling, it has also highlighted what a tight-knit community (and world) can look and feel like. Both residents I interviewed were encouraged by the response of the community, regardless of what ultimately happens in November. “Now you have a couple hundred more involved in the city than they’ve ever been,” said the Hermosa Beach travel agent. “It was surprising to know how many people were willing to make a statement and show that they cared about their community,” Armato added. 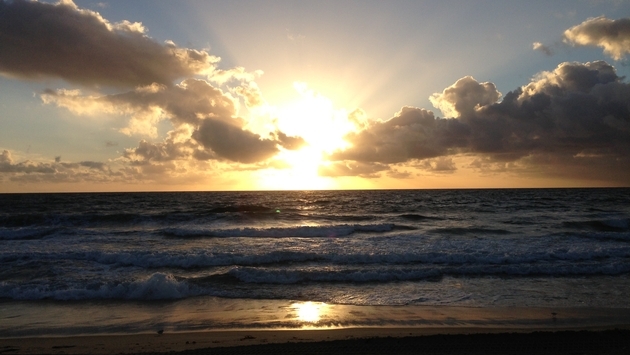 I look at Hermosa Beach now and see it as one of the last remaining tranquil spots in L.A. But, what really scares me is: There may come a time down the line when there will be a few tranquil spots remaining on this planet. We all have the responsibility to be stewards of the world we live in, but unnecessarily destroying the magical places we have left is headed in the wrong direction. For those in Hermosa Beach, keep the oil drilling ban intact. For those elsewhere, keep our planet intact.